I think most anyone living in the Pacific Northwest is fluent in the language of Weather (specifically the "rain" dialect) as it somehow infuses most of what we do, without necessarily imposing limitations. In fact, this language or dialect is what underscores much of what makes this region of the country notable for its outstanding farms, wine production and vibrant landscape. And for those of us that are fluent, it also underscores the ability to appreciate and bask (with no baggage of what came before) in the dialects of "sun" and "warmth," as well. When Feast Portland blew into town over a span of four days this past weekend, I first thought of the weather... and then the foodist element. As luck would have it this event descended upon Portland on what I immediately realized would be Rose Bowl days. As a kid growing up in Southern California, every Rose Bowl game televised seem to fall on one of those unreal, shirt-sleeve days in the middle of what California calls winter, with spectacular blue skies, a blazing ball of a sun, and the resulting glimmer and sparkle that that combination casts. Knowing the vast audience that would witness this beauty each and every year always made me think... there's another million people that will want to move here. This past weekend in Portland evoked a little of the same feeling... for we had a heady combination of beautiful Northwest Fall weather (my favorite time of year) and the food, celebrity and general hoopla that Feast Portland so brilliantly produced. Being from the area and already committed to a fairly chaotic weekend, I only attended two events... Mark Bittman's talk at the Arlene Schnitzer Hall and the Speaker Series entitled The Global Local: Reinventing Food Cultures. Walking over to hear Bittman, I parked in an underground lot below Director's Park and came up into the center of a magnificent mob of people enjoying the likes of some of my favorite chefs at the Sandwich Invitational. Though I did feel a slight pang of remorse for not partaking in the revelry of this event, Mark Bittman proved to be an engaging, insightful presenter of some of the more important food topics of today... obesity and its affects beyond belt size; the need to flip the cost factor on fresh versus highly processed foods; the need to address school lunches in a more meaningful way, etc. All topics that should be part of our daily diet of conversation. The Global Local panel of speakers offered another great dialogue with respect to where our "local" food perspective stands today and what the more global perspective looks like with regard to politics, actual implementation, etc. Though intrigued with the topics I do have to admit that my real impetus to attend was the fact that Gabrielle Hamilton, renowned chef-owner of NYC restaurant, Prune, and author of one of my favorite books, Blood, Bones & Butter, would be participating. Missing out on nabbing tickets to the dinner she was hosting, I grabbed tickets to this panel and thoroughly enjoyed hearing her somewhat salty banter with Adam Rapoport (Editor in Chief of Bon Appétit) regarding the realities of incorporating sustainable, local and organic sensibilities in line with running a top restaurant. Though I wish she'd write another book... surely she has more to share... at the very least I hope that someone in her ranks can convince House Beautiful to include a bit of her personal stories along with the monthly recipe she shares in their publication. Fine Cooking published a piece of hers back in 2011 (March, I think) that was such a poignant little writing apéritif... such a shame to waste the opportunity to include her words along with her food. Notables, along with Hamilton and Rapoport, were the Portland duo of Randy Gragg (Editor in Chief, Portland Monthly) and Karen Brooks (Restaurant Critic and Food Editor, Portland Monthly); local farmer Anthony Boutard; rising chef, Sean Brock (McCrady's and Husk restaurants, Charleston, S.C.); the engaging Francis Lim (Features Editor, Gilt Taste... among other credits); the entertaining Chris Ying (Editor of Lucky Peach) ; our own Rep. Earl Blumenauer (US Congressman, Portland); Co-CEO of Whole Foods, Walter Robb; and video features from Boaz Frankel (Filmmaker, "The Un-Road Trip"). I happen to sit next to the brother of Karen Brooks, who I also do not know, who was so enthusiastic in his support of his sister it was heartwarming... giving big thumbs up in her direction on the stage and then turning, ever-so-slightly in my direction and whispering "that's my sister... we're so proud of her." How great is that! While I came away from the events I attended with a bit more insight on the food scene, both here in Portland, across the country, and globally, I boiled it all down to realizing that much of the change (improvement) we want to see needs to begin at home... being better educated with regard to nutrition, eating and meal planning (and those that are more knowledgable reaching out to those that are not); being more vocal in school districts and local government; standing up for promoting fresh ingredients and equal access to them. And, the realization that you can do all of this and still support and enjoy the wares of really interesting and talented chefs, many of whom have proliferated Portland... to our great pleasure. In what seems to be a fitting cap to the weekend, I stood with a friend at one of the tall bar tables positioned in the lobby of the lovely Gerding Theater to enjoy the nibbles offered during the speakers' break. Huddled along with us were a few other people, happily sharing the same small table. Five of us were from in and around Portland, and the sixth was a woman who had driven all the way from the east coast to attend Feast Portland. Oh... and also move here! Thinking about Portland's unique language, I welcomed her to our city and asked if she had had much exposure to the area (translation: do you know it rains a lot and can sometimes be gray for 30 days straight?) and she immediately smiled a knowing grin and said "yes, I've been here at all times of the year." I think she'll do just fine. This salad has both everything and nothing to do with Feast Portland. Nothing in the sense that it's not anything that was featured. And, everything in that it was this particular event that got me to thinking more about the really fresh, more plant-based dishes I enjoy making... and this is one. 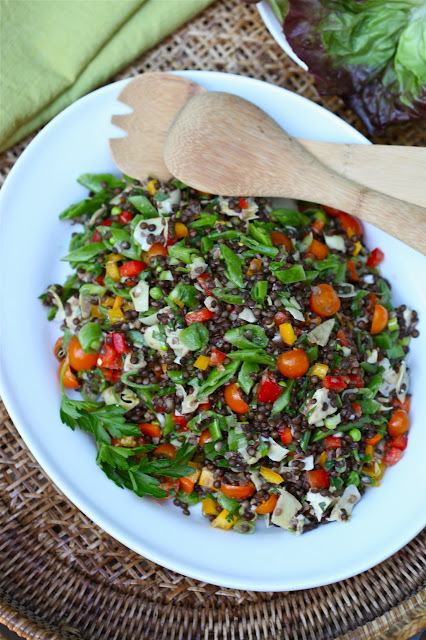 The little black lentils are not only a great source of both protein and fiber, they also have a delicate little bite that, along with the sugar snap peas, lend a wonderful crunch to the salad. 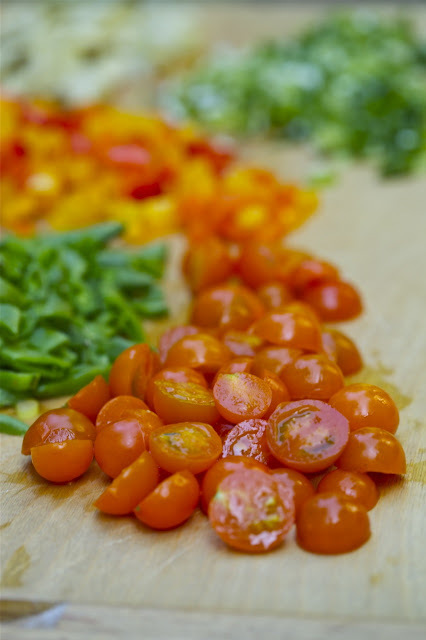 Little orange halves of Sungold tomatoes offer a perfect pop of natural sweetness. And a generous chop of marinated artichoke hearts provides a wonderful tang of flavor that melds beautifully with the slight dash of extra-virgin olive oil and splash of fresh lemon juice that finishes the mix. Not only is it great to enjoy on its own, it pairs well as a side dish, and packs beautifully for lunch the next day... or as a carry-on nibble when flying. This is the type of salad that can be made ahead and popped in the fridge for a quick lunch or snack on-the-go... helping to curb or prevent bad snacking habits. Now... back to the Weather... which was, by the way, another beautiful Fall day. This salad is great on its own, as a side, or served up "taco-style" on some fresh butter leaf lettuce. Cook and prep lentils according to package directions (for a cold salad)... on a simmer in hot water for about 20 minutes. Drain and rinse lentils with cool water. Combined cooled lentils with all veggies, dress with olive oil and fresh lemon juice. Mix well and season with kosher salt, to taste. If dairy is your friend, a good chop of feta cheese is fabulous in this mix.